1. Only two complete unreleased takes are found on the album, and to make matters worse, both of them are versions of "Singing Tree," the one song that differs a lot in quality from the rest. 2. No alternate takes of "Mine" are included, only the master, although outtakes exist and have been released. 3. I do miss the January 1968 recordings, especially "U.S. Male" and "Too Much Monkey Business" that I feel share a connection with the September 1967 sessions (mainly due to Jerry Reed's guitar acoustic guitar picking). Don't get me wrong, the songs contained on Elvis Sings Guitar Man are among some of the best that Elvis recorded during the 60's. I just feel that the two disc classic album format in this case limits the value of the release. At least, if you like me, already have all the outtakes (except the two takes of "Singing Tree") on other FTD and BMG releases. Why not go for a three disc release instead, including alternate takes of "Mine" as well as ones from January 1968? That would've made more sense to me. That said, I have to mention the making of "Guitar Man" from the September 1967 session. Listening to Jerry Reed taking command of the recordings is fascinating stuff, as is the studio banter between him and producer Felton Jarvis. "I haven't played all all weekend," Jerry mutters as he and the musicians works out the intro of "Guitar Man." I actually found myself jumping to the second disc after the first takes on disc 1 to be able to follow the progression of the song. Another highlight is the recording of "Big Boss Man" that in all fairness features a couple of incomplete, unreleased takes, showing Elvis having some trouble with song. "Elvis, you're jumping just a hair early," Felton cautions. "Alright, which hair is it?" Elvis deadpans. So, am I being too critical? Maybe. But imagine a three disc version of Elvis Sings Guitar Man, with a couple of more unreleased takes, the January 1968 material (including outtakes) and as a special bonus Red West's recordings of "Indescribably Blue" and "I'll Remember You" from June 1966 (he filled in for Elvis as the musicians laid down backing tracks). That would've made an ever greater "album that would have never been." It's amazing how Elvis pops up when you least expect him to. I recently experienced another example of this leafing through a magazine at my parents published by the Swedish Aviation Historical Society (my father's an aviation buff and a member). Among all the photos of Swedish aircraft, there was the well known shot of Elvis kneeling in front of Princess Margrethe of Denmark, Princess Astrid of Norway, and Princess Margaretha of Sweden on the set of G.I. Blues. What on earth was it doing in an aviation magazine? The line to Los Angeles opened on June 3, 1960, and in connection with this SAS invited the three Scandinavian princesses Margrethe of Denmark, Astrid from Norway and Margaretha of Sweden on the maiden flight. 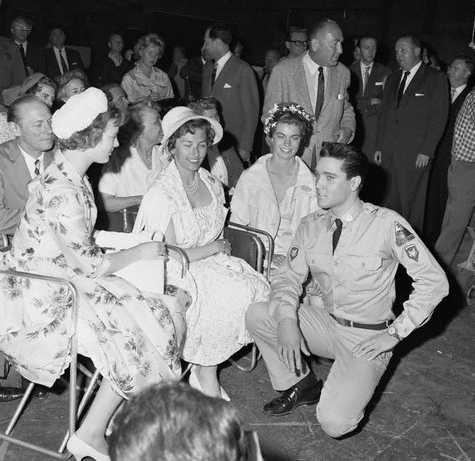 The American press was beside itself with joy, and a meeting between the princesses and Elvis Presley during the visit was the crowning glory. Better PR for a company could not be achieved in the USA! 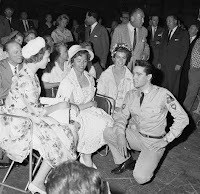 The caption stated that Elvis sang "Are You Lonesome Tonight" in front of the princesses, but I'm sceptical about that. 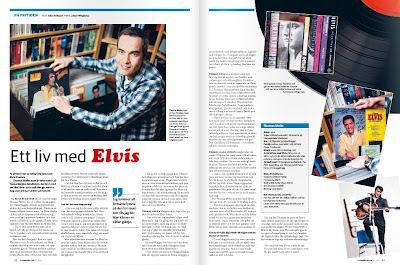 Nevertheless, thanks to my father and his magazine I learned of the background to why the three Scandinavian princesses met Elvis in June, 1960. For ten years I worked as a journalist at a radio station called P4 Halland, one of Swedish Radio's 25 local channels around the country. 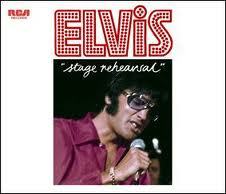 I specialized in news reporting, but soon found myself making programs about Elvis as well. 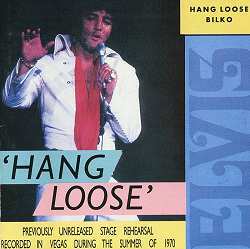 On of my first efforts (in 2001) was a series of ten short episodes dealing with different parts of Elvis' career, both familiar and more unknown. With a running time of five to eight minutes each, I soon found the series broadcast on most of the other local channels as well. Although ten years ago I still remember how proud I felt. Therefore I was glad to notice that my old place of work, P4 Halland, is repeating the series right now, broadcasting one episode each Tuesday. So far seven episodes have been made available on the station's website, among them one about Elvis' movie songs during the 60's, another telling the story of his first recordings and a third describing the making of the NBC TV Special in 1968. 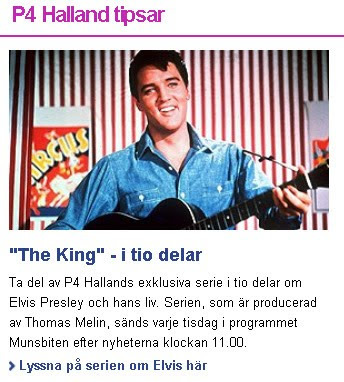 So if you understand Swedish or just want to listen to some Elvis music, you're more than welcome to aquaint yourself with P4 Halland's "exclusive series in ten episodes about Elvis and his life," as it says on the their website.